Few artists in the Indian entertainment industry can claim to be a major wild card quite like Rahul Ranade can. 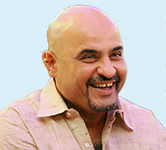 After composing the music scores for feature films, directing and judging reality shows and touring the world with a theatre troupe as an actor, Rahul is has a reputation of being a skilled and diligent professional in a multitude of roles; be it music, theatre, films or events. Rahul is known as a maverick artist whose work is unconventional yet technically very sound. He uses a plethora of musical genres, instruments and themes ranging from the madka, to the distortion guitar. His training in Indian Classical music and his knowledge and aptitude in the Western styles aided by his adeptness in technology make him a unique composer and music designer. He started his musical journey at a very young age through tabla and vocal lessons and constant encouragement and nurturing by his late mother. During his college days, he first got a taste of the real world of music, theatre and cinema and explored it in various roles such as acting, directing and composing. He toured with the troupe of Gashiram Kotwal along with Dr. Mohan Agashe and Dr. Jabbar Patel around the world. He learnt firsthand from stalwarts like Sai Paranjpye, Rajdutt and Ketan Mehta and they were his early influences. Gradually, Rahul decided to focus on music and started composing jingles and music for plays and tele-films. His Bollywood debut came in 1995 for Sai Paranjpye’s ‘Disha’. His debut in the Marathi film industry soon followed for ‘Aai’ by debutante director Mahesh Manjrekar. Rahul and Mahesh would soon form a camaraderie working together on several successful films. Today, his journey continues as he explores and excels in new roles and tries to expand new horizons.